The breakpad project is an open-source framework for crash reporting. In CDH 5.8 / Impala 2.6 and higher, Impala can use breakpad to record stack information and register values when any of the Impala-related daemons crash due to an error such as SIGSEGV or unhandled exceptions. The dump files are much smaller than traditional core dump files. The dump mechanism itself uses very little memory, which improves reliability if the crash occurs while the system is low on memory. Important: Because of the internal mechanisms involving Impala memory allocation and Linux signalling for out-of-memory (OOM) errors, if an Impala-related daemon experiences a crash due to an OOM condition, it does not generate a minidump for that error. By default, a minidump file is generated when an Impala-related daemon crashes. Set the --enable_minidumps configuration setting to false. Restart the corresponding services or daemons. Set the --minidump_path configuration setting to an empty string. Restart the corresponding services or daemons. In CDH 5.9 / Impala 2.7 and higher, you can send a SIGUSR1 signal to any Impala-related daemon to write a Breakpad minidump. For advanced troubleshooting, you can now produce a minidump without triggering a crash. The minidump files for impalad, catalogd, and statestored are each written to a separate directory. To specify a different location, set the minidump_path configuration setting of one or more Impala-related daemons, and restart the corresponding services or daemons. If you specify a relative path for this setting, the value is interpreted relative to the default minidump_path directory. Like any files used for logging or troubleshooting, consider limiting the number of minidump files, or removing unneeded ones, depending on the amount of free storage space on the hosts in the cluster. Because the minidump files are only used for problem resolution, you can remove any such files that are not needed to debug current issues. To control how many minidump files Impala keeps around at any one time, set the max_minidumps configuration setting for of one or more Impala-related daemon, and restart the corresponding services or daemons. The default for this setting is 9. A zero or negative value is interpreted as "unlimited". Typically, you provide minidump files to Cloudera Support as part of problem resolution, in the same way that you might provide a core dump. 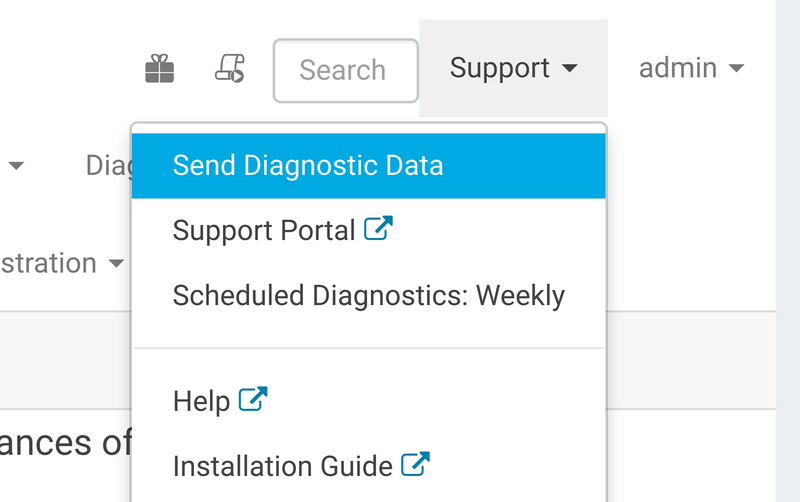 The Send Diagnostic Data under the Support menu in Cloudera Manager guides you through the process of selecting a time period and volume of diagnostic data, then collects the data from all hosts and transmits the relevant information for you. You might get additional instructions from Cloudera Support about collecting minidumps to better isolate a specific problem. Because the information in the minidump files is limited to stack traces and register contents, the possibility of including sensitive information is much lower than with core dump files. If any sensitive information is included in the minidump, Cloudera Support preserves the confidentiality of that information. The following example uses the command kill -11 to simulate a SIGSEGV crash for an impalad process on a single DataNode, then examines the relevant log files and minidump file. We locate the log directory underneath /var/log. There is a .INFO, .WARNING, and .ERROR log file for the 23114 process ID. The minidump message is written to the .INFO file and the .ERROR file, but not the .WARNING file. In this case, a large core file was also produced. The .INFO log includes the location of the minidump file, followed by a report of a core dump. With the breakpad minidump feature enabled, now we might disable core dumps or keep fewer of them around. E0623 14:03:43.911002 23114 logging.cc:118] stderr will be logged to this file. The resulting minidump file is much smaller than the corresponding core file, making it much easier to supply diagnostic information to Cloudera Support. The transmission process for the minidump files is automated through Cloudera Manager.